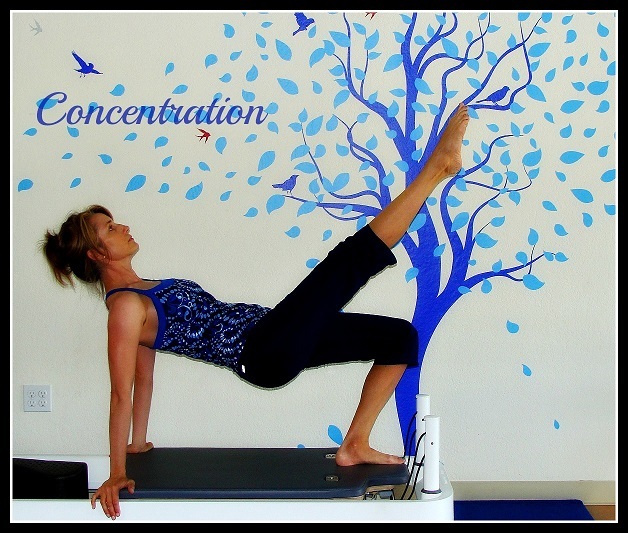 Pilates requires a high level of concentration and this particular Pilates concentration exercise is one of my favorites for gaining a deeper body awareness and control. Post by Pilates Exercises for Healthy Back and Joints. There are many exercises in Pilates that elicit control, focus, and concentration, but the leg pull back support shown here on a sliding carriage is one of my favorites for all the different muscle groups that come into play. The concentration of the pelvic lift along with scapular support in the back are of particular importance in this exercise. If one or the other is not stable the whole thing falls apart. This exercise helps to connect the shoulder girdle and pelvic girdle, which along with everything in between makes up the bulk of our core. Concentration, Control, Focus, Breath, Precision, Flow; these are all principles of Pilates work that help to connect the mind and body. When we incorporate these principles into our practice we change not only our bodies physically, but also on a mental and even spiritual state. If you are a Pilates fan and would like to stay updated on all the latest in the Pilates world subscribe to my blog and facebook pages. Leave Pilates Concentration Exercises and find out more about my site and how Pilates can help you enjoy life.